Beautiful Branson, Missouri offers endless options for family entertainment: music, theme parks, and delicious country cooking. 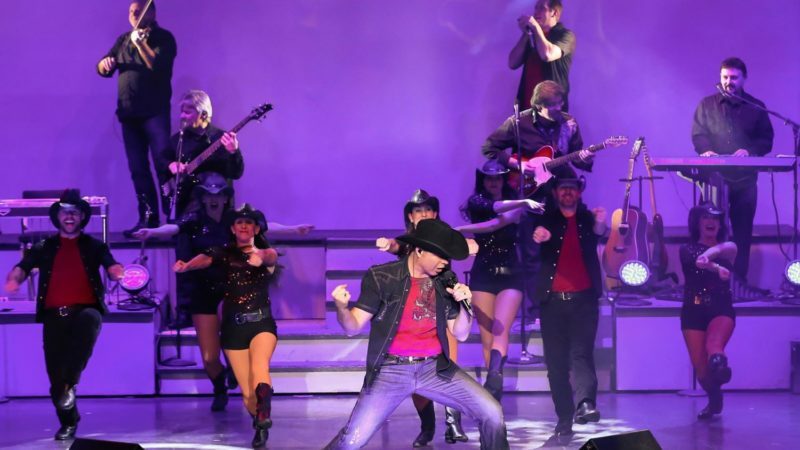 No matter what you do in Branson, a music show (or two or more) needs to be on your agenda. 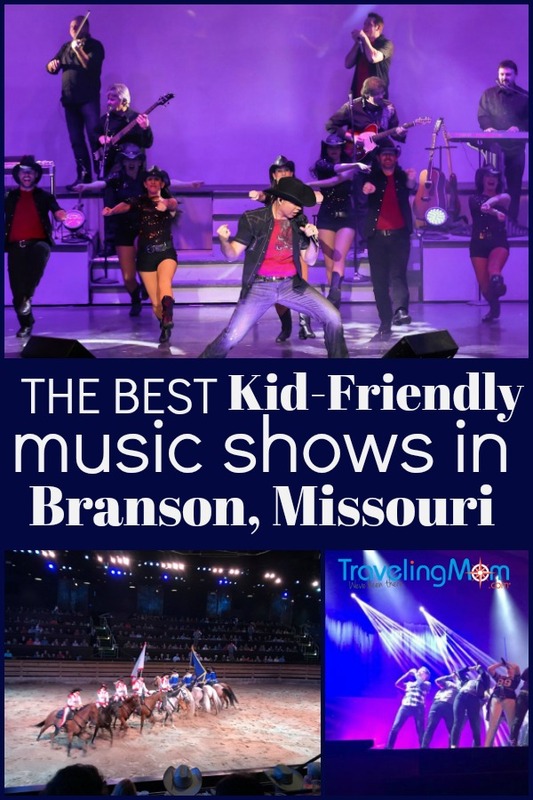 Texas Traveling Mom Jill is an expert on all things Branson and is passing on her picks for the five best kid friendly music shows in Branson, Missouri. 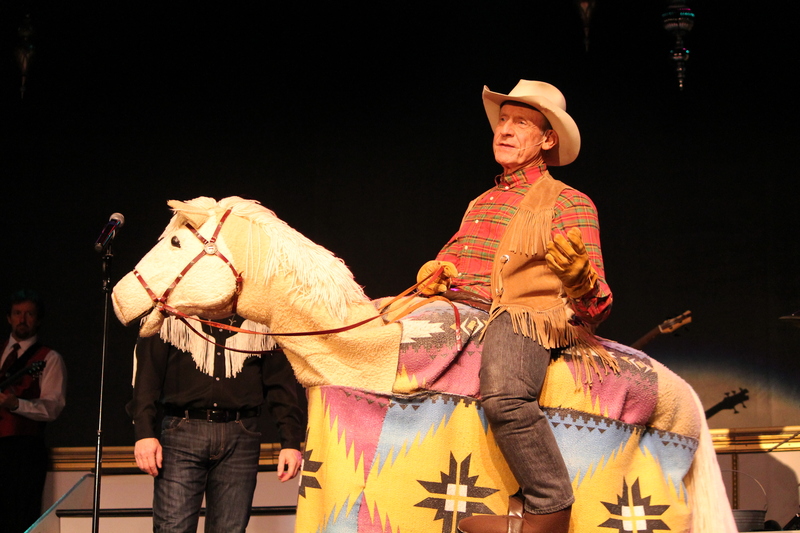 Clay Cooper’s Country Express will make you laugh as much as it will make you tap your toes and dance in your seat. Cooper performs with his wife and two sons as well as a host of talented dancers and singers. There is a super-fun and interactive pre-show, so arrive early and don’t miss that. Although Clay engages the audience with his awesome music and playful banter, the real comic relief in this outfit is Matt Gumm. He plays several roles during the performance, from silent movie director to an elderly man sitting in the audience. If country music isn’t your thing, don’t count this one out. Although the show is indeed called Clay Cooper’s Country Express, the show is probably about 50 percent country at best. There is a healthy mix of pop and rock…truly something for everyone. Tickets are $39 for adults, $19 for teens and $17 for kids 4-12. Family packs and VIP seating (first three rows) are available at the box office. The Clay Cooper Theater is also home to several other shows that look worthy of checking out. Concessions and a gift shop are available. The Hughes Brothers are four brothers from Taylorsville, Utah and they head up the largest family in the world that performs together. 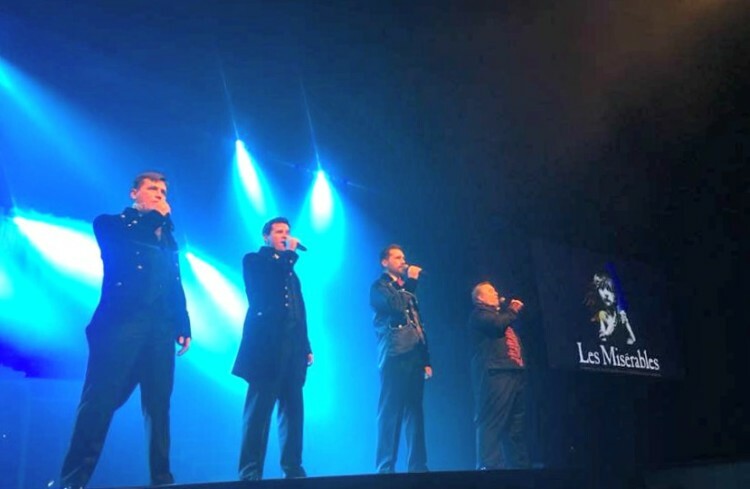 There are actually five Hughes Brothers but only four of them currently perform in the show in Branson. The Hughes Music Show has a little bit of everything: country, pop, show tunes, strings, dancing, and lots of kids. I mean lots of kids. The costumes, choreography and lighting are Broadway show quality. Concessions and a gift shop are available. They also offer dinner shows. Contact the box office for ticket info and pricing. Dolly Parton’s Stampede is a dinner show, so come hungry for some down-home cooking. Guests are seated either on the red side or the blue side and you’ll be cheering for your team accordingly. If you’ve ever been to a Medieval Times show, this is a similar setup. And yes, you can choose your side when you purchase your ticket! 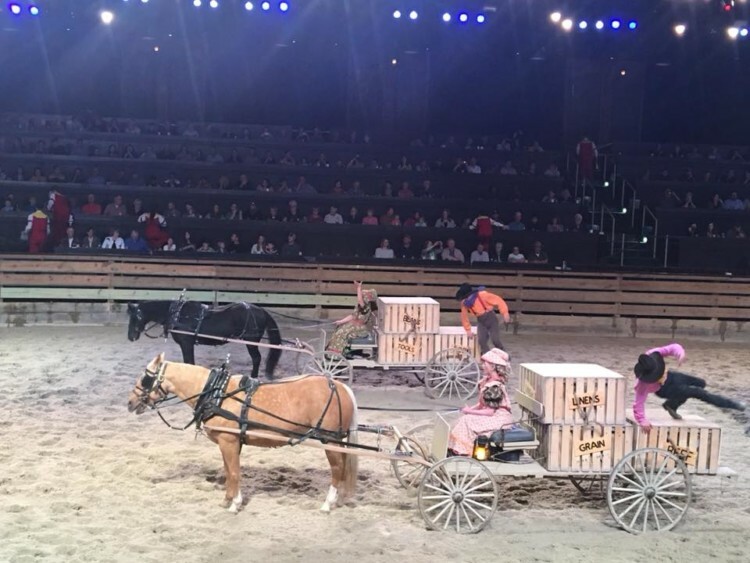 The show includes horses, trick riders, buffalo, pigs, dogs, chickens, acrobatics, pyrotechnics, covered wagons and more. That’s a lot, right? 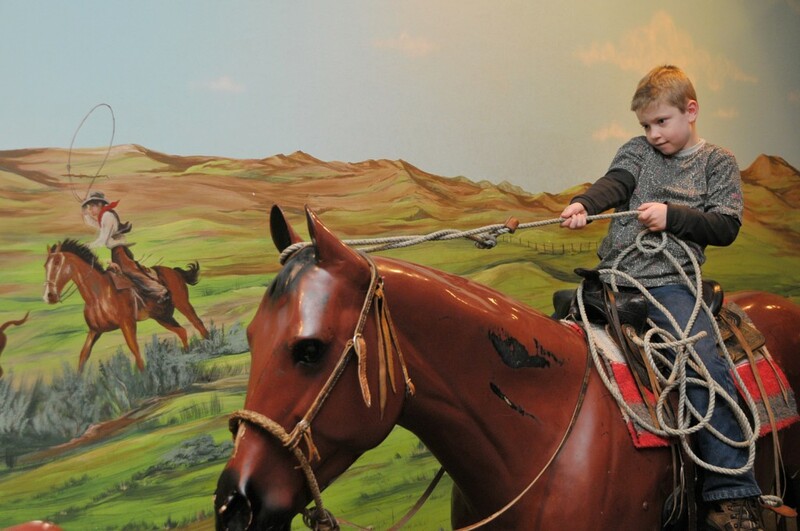 The Dolly Parton stampede is a very fast-paced and interactive show. Dinner is eaten with your hands, so if that really bothers you, sneak a plastic fork in your bag. The standard fare is chicken, smoked pork, corn on the cob, and a baked potato with an apple turnover for dessert. The appetizer is out of this world – cream of vegetable soup sopped up with a buttermilk biscuit. Gluten free and vegetarian options are available. Dolly Parton’s stampede also offers a preshow where you can listen to entertaining country music performers before the dinner bell rings. You can also enjoy looking at the horses in their stalls as you walk into the venue. Tickets for preferred seating are $54.95 for adults and $34.95 for kids. Standard prices are slightly lower, at $49.99 and $29.99, respectively. A gift shop is available. And no, Dolly Parton does not take part in the show and you will not see her. This show is very popular and sells out far in advance, so make your reservations as quickly as possible. Showboat Branson Belle is a turn-of-the-century style paddle boat on Table Rock Lake. 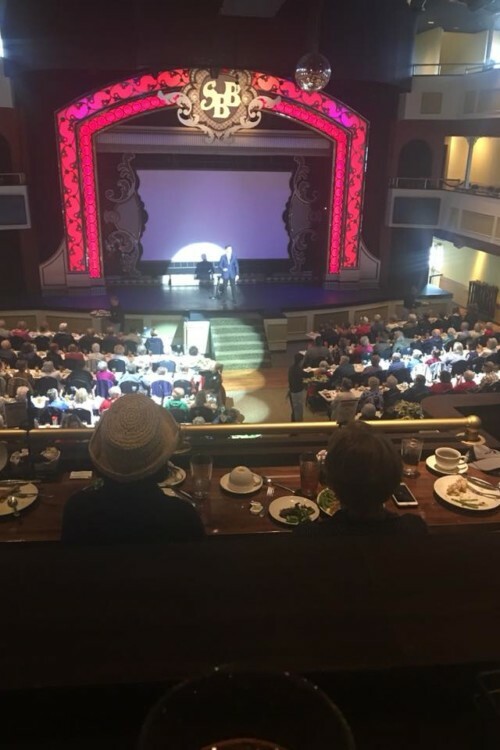 Unlike most of the other shows, Showboat Branson Belle is not on the strip but is still easy to get to…about a 10-minute drive from the center of town. Passengers are treated two a scrumptious three-course meal and dazzling entertainment. 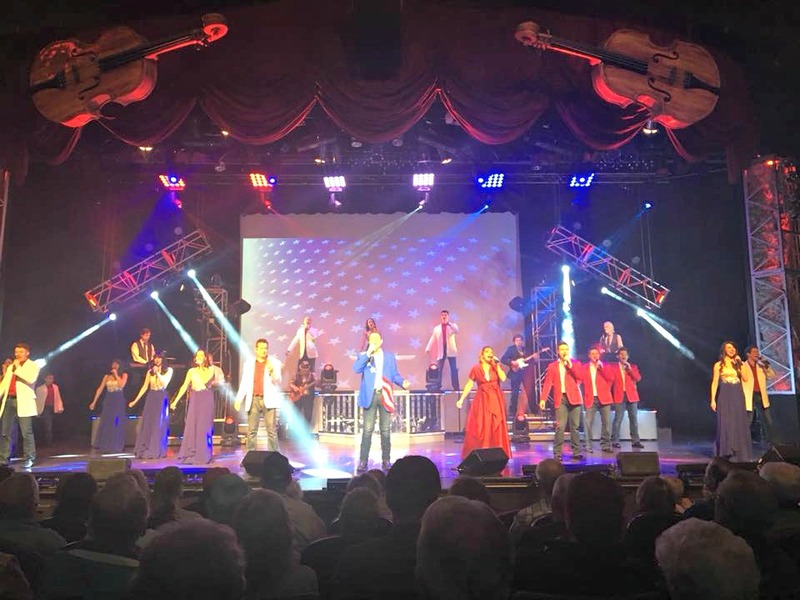 Like the other shows I’ve mentioned, Showboat Branson Belle has a great variety of musical entertainment from country to pop to gospel, although the current show is heavy on classic rock. Prior to the show and during intermission, guests can stroll on the deck and take pictures of the beautiful scenery as well as browse in the gift shop. Showboat Branson Belle cruises gently around Table Rock Lake during the shows, although she does stay docked during inclement weather – and the show does go on! Tickets are $55 for adults and $28 for kids, although you can upgrade your experience. I recommend the Captain’s Club seating. This allows you premium seating, early boarding and more meal choices. The price jump isn’t that much considering the extras you get: $75 and $38 for adults and kids, respectively. Check Showboat Branson Belle’s website for information on seasonal or themed shows and ticket information. This is the show that started it all in Branson. The Mabe family has been performing in Branson for almost 60 years and their show is still going strong. Branson’s Famous Bladknobbers features primarily country music, sprinkled with a hefty dose of comedy. You are probably asking yourself “What the heck is a Bald Knobber?” The Bald Knobbers were a group of vigilantes in the Ozark region of southwest Missouri from 1883 to 1889. The group got its name from the grassy bald knob summits of the nearby Ozark Mountains. 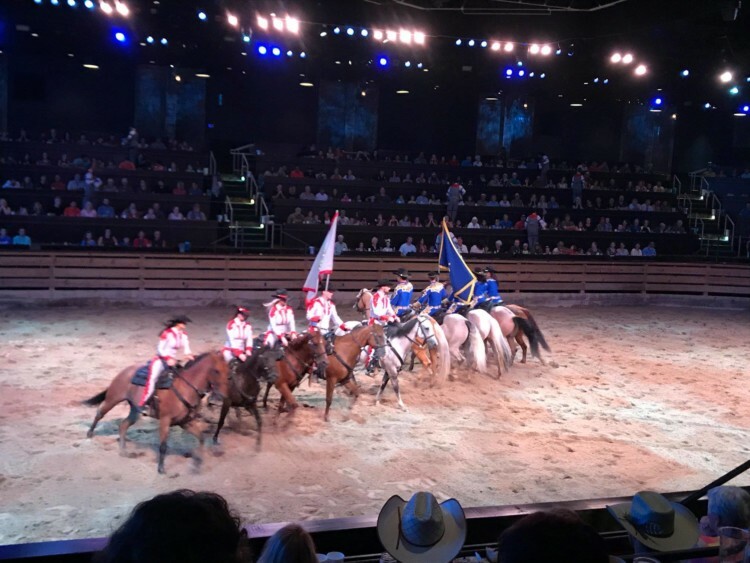 This show is the original music and entertainment show in Branson, and although you probably won’t find any vigilantes, this show is worth seeing for the heritage aspect. 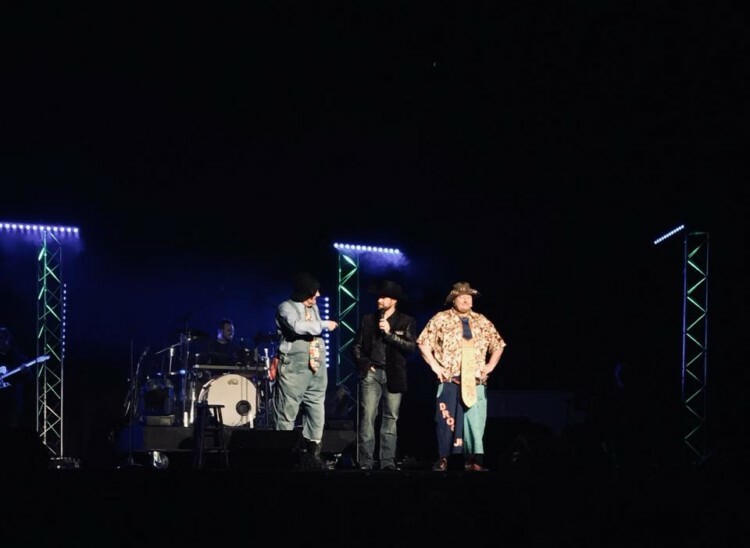 The performers are young, fresh and vibrant but the style of show is very old-school country with lots of comedy skits reminiscent of Hee Haw. Adult tickets are $38 and children are $19. Family packs can be purchased at the box office at a discount. This theater also offers a separate illusionist show. This just scratches the surface of the shows available in Branson but I can vouch that all of these are kid-appropriate and family friendly…i.e. no profanity or suggestive lyrics. The shows are all lively and fast-moving and are great for guests of all ages. All venues offer snacks and soft drinks but none serve alcohol. It’s also important to remember that most of the shows in Branson are family enterprises. 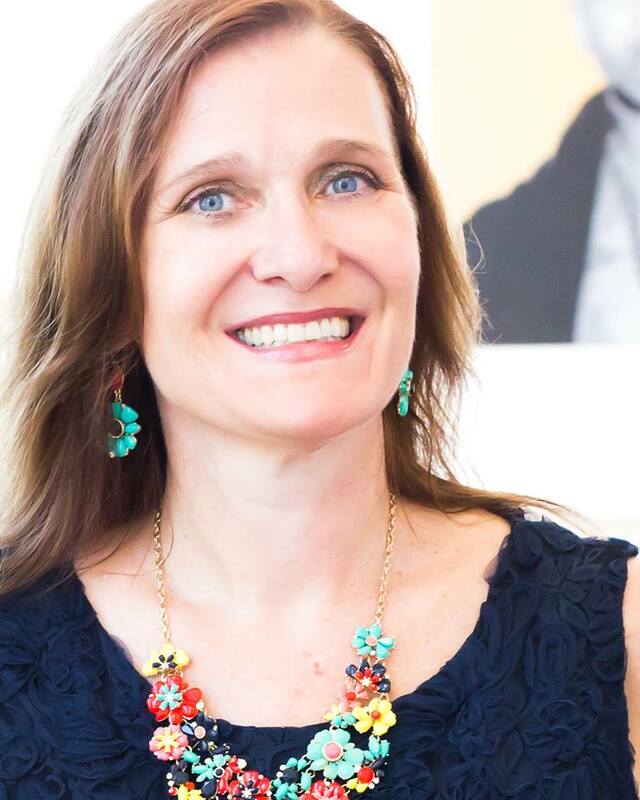 The performer you see on stage just might be the same person behind the concession counter serving you popcorn during intermission and maybe even the same person who cleans the theater after the show. When choosing to see these amazing, Broadway quality shows, you might just be supporting a family-run business and that is a good feeling. 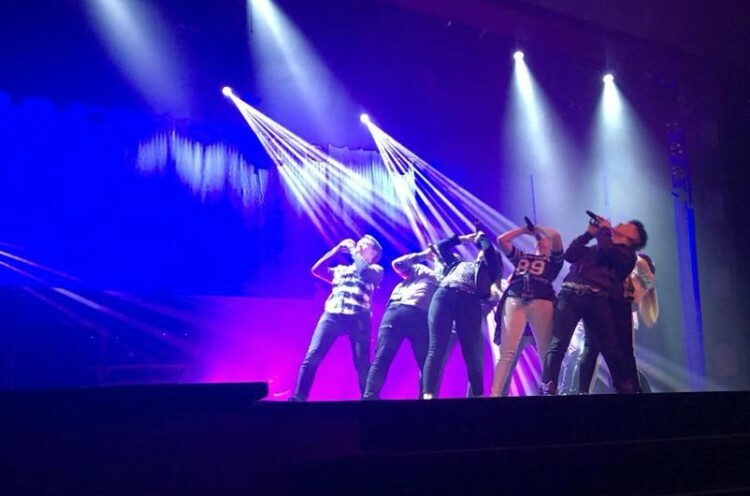 Most music shows in Branson, Missouri will switch to Christmas-themed shows in early November (or even early as late October) so if you’re visiting during the winter holidays, expect a little bit of a change of pace. Branson is 4o miles from Springfield, Missouri. This paradise in the Ozarks offers natural beauty, family fun and Broadway-quality musical entertainment. In other words, the perfect place for a family vacation! Thanks for the memories, and the incentive to return! I have experienced three of your five recommendations and agree wholeheartedly. That’s awesome, Christine! This just scratches the surface and I can’t wait to go back and find some new favorites! These shows and venues all looks like so much fun! I love that so many are family businesses, with the families themselves performing! Yes, I thought that was one of the BEST parts! 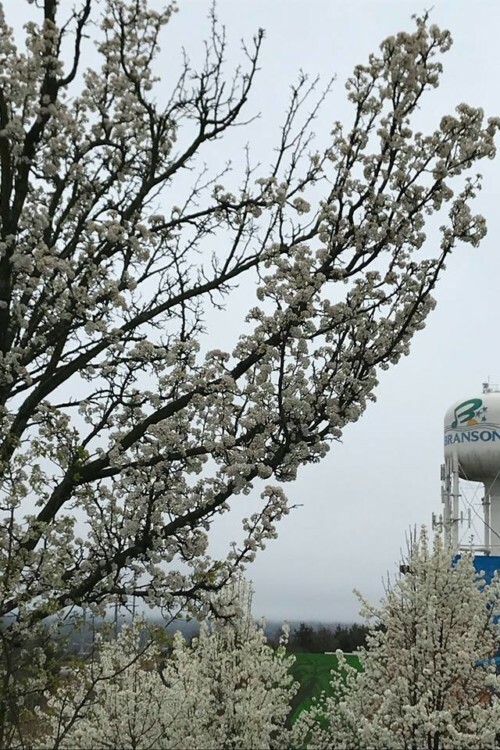 Great ideas and Fun things to do in Branson Missouri with kids of all ages. We love ? 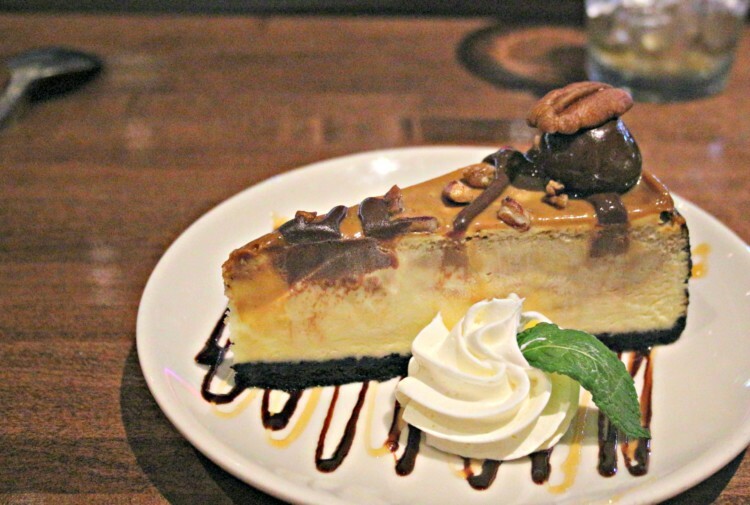 Branson, it has so much to offer for a family vacation. Branson is changing and always adding new fun things to do – see – and explore. Table Rock Lake is another fun idea if you love taking your kids for a boat ?‍♀️ ride. So relaxing the kids would love swimming ?‍♀️ in the lake. We are close to the lake and Silver Dollar City.